CLICK ON ARROW IN THE CENTRE OF THE IMAGE BELOW TO HEAR THE ENTIRE SONG – YOURS TO OWN FOR ONLY $1.99 – click “Add to Cart”. Included on the Rainbows and Sunshine Album too! The album and individual songs are also available on iTunes. Row Row Row Your Boat is a traditional nursery rhyme loved by children. However, Rainbows and Sunshine has given this favourite lots of extra dimension and opportunity to “play”, create, and encourage imagination. It now has extra, original verses which turns the song into an engaging story for little songsters! Lots of animal action and sound effects to join in with in this great musical arrangement. We love to give kids loads of interesting genres of music and so with our many songs we have a diverse range of styles….. and they love it! The song starts with the traditional nursery rhyme verse and continues on to have original Rainbows and Sunshine verses to tell a fun story. The children pass different animals while rowing in their boat and there’s loads of participation with kids wanting to do the sounds and actions along the way. And what happens in the story when the song characters lose a shoe? Or when the boat gets a leak! Can they fix it with chewing gum? Should they swim to the shore? The familiar characters from our other Rainbows and Sunshine songs and videos appear in the song too, which adds to the fun! This is a great song for developing listening and comprehension skills, plus it engages children actively in the storyline by encouraging their participation and actions. 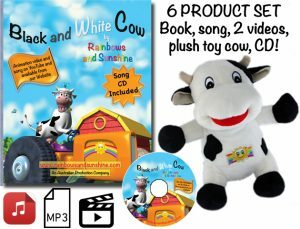 Not only does Rainbows and Sunshine have lots of songs for children, check out our fabulous 3D animated videos – each of them has a song-story underneath. 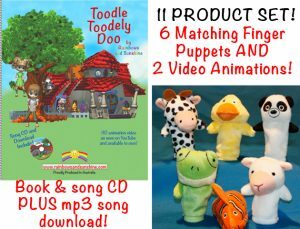 And what makes us unique is our signature products: complete matching sets of hard copy book, CD, mp3 song download, videos (both “original” and “singalong” with the lyric onscreen), and accompanying toys. You can see a preview of two of these below….. Wide Mouth Frog – a joke set to music! © Rainbows and Sunshine 2017. All Rights Reserved.